This is a sponsored post written by me on behalf of Minute® Ready to Serve Rice. As always, all opinions are 100% mine. With a little guy who has Celiac Disease and myself being allergic to corn and wheat, there are a lot of foods that are off limits or difficult to find in options that are safe for us. Regular pasta is not safe for either of us and most gluten free pastas are made from corn. One thing we know is safe for both of us is rice and we eat a lot of it with our meals. Because rice requires little to no prep and is a good for us, allergy free food it’s a staple in our pantry. 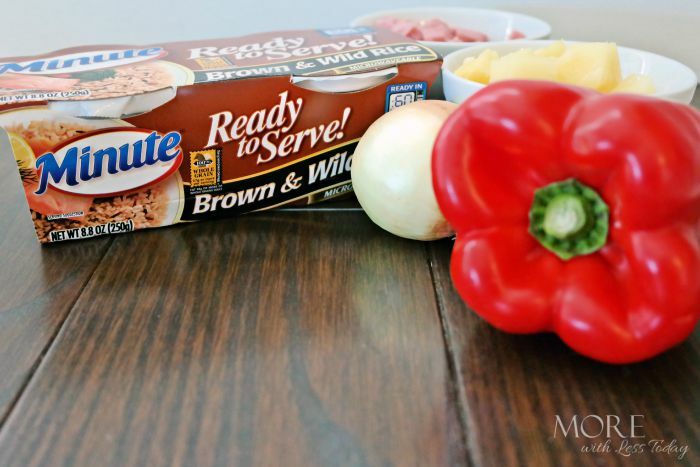 This recipe is quick and easy anyway but when we use Minute® Ready to Serve it’s even easier. It’s also portable and is the perfect portion! 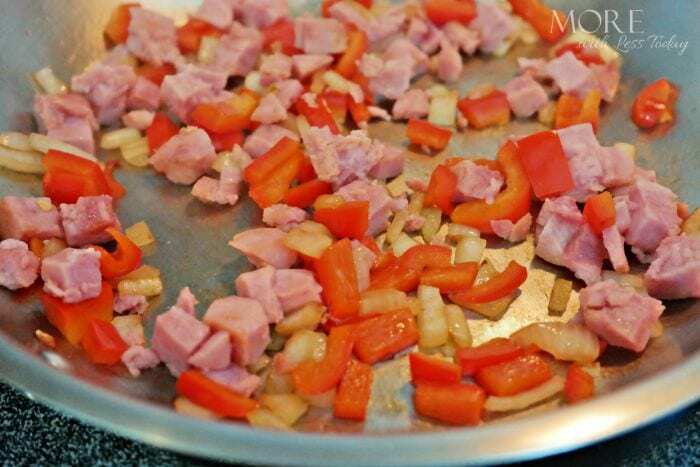 Saute the onion and red pepper in a medium skillet until they begin to soften then add the ham pieces. 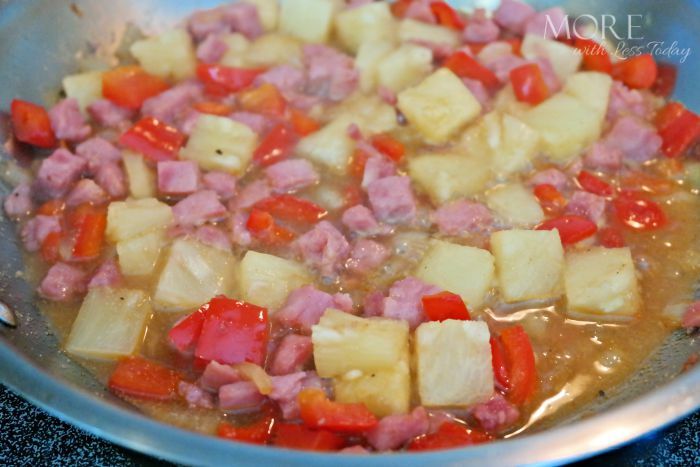 After the ham, onion, and pepper have cooked for several minutes, add the pineapple pieces. Pour approximately 1/3 cup of pineapple juice into the pan. Add the honey and seasonings and stir well. Let liquid begin to boil, then reduce heat to simmer and continue cooking for several minutes. If you’re taking this meal on the go, you’ll want to let the above mixture cool and place approximately 1 cup into a microwave safe, portable container. If you’re eating it right away turn heat down and cook your rice while it simmers. 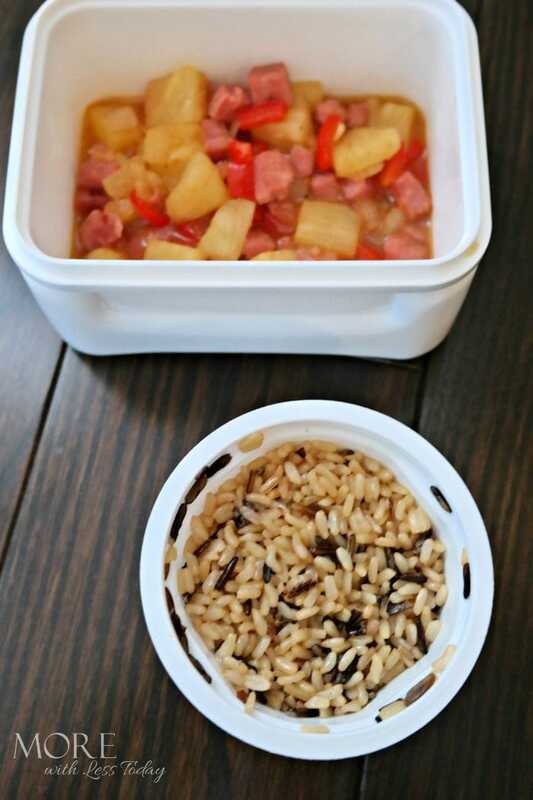 With 1 cup of the pineapple ham mixture ready in a portable container, I can grab a Minute® Ready to Serve Rice container and make a quick meal any time. 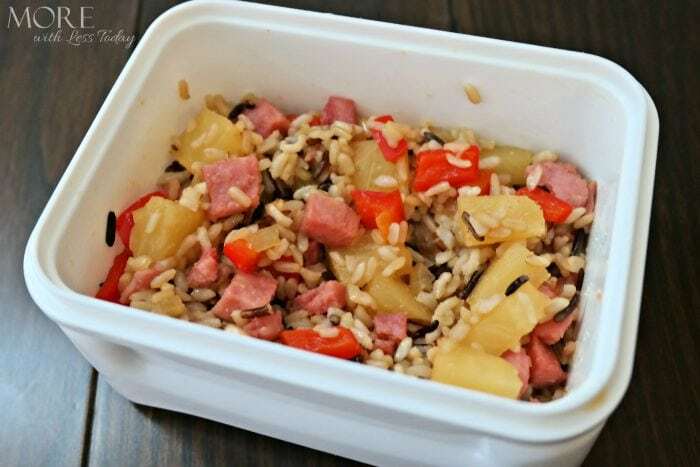 When I’m ready to eat it, I simply heat the rice and pineapple mixture in the microwave for 60 seconds each and stir it together. 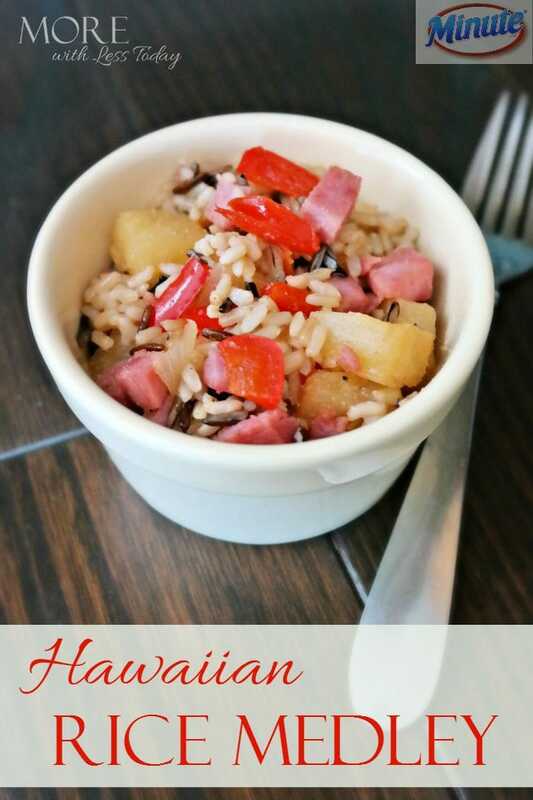 The Minute® Ready to Serve rice is great on it’s own but turning it into a meal of Hawaiian Rice Medley with protein, fruit, and veggies is a delicious variation! Minute® Ready to Serve is whole grain and available in Brown Rice, Brown & Wild Rice and Multi-Grain Medley, Jasmine Rice, White Rice, Chicken Rice Mix, Yellow Rice Mix, and Fried Rice Mix as well as the new Minute® Ready to Serve Black Beans & Rice, which is ready in 90 seconds. All are conveniently packaged in two individual single-serve cups that are perfect for portion control and on-the-go meals. How do you mix up your rice recipes by adding other ingredients? For recipes, including Stir-In recipe ideas, and more information about the Minute® Rice family of products, visit their website. I have never thought to eat rice with this type of medley, but I am intrigued! I think I will really like it! Thanks for the recipe! my kiddos don’t even know the difference as I have been using brown rice since they were babies! SO much healthier for everyone! I love these new options from Minute Rice! Yum, this would make an awesome lunch for us. I really like having that Minute Rice for some quick recipes. This reminded me of a little kiosk called Rice In A Box, it is basically stirred fried rice mixed with a topping of your choice. Minute rice is a good choice if we want to “personalize” a dish with rice in it. Thanks for the recipe too! I love that there’s a hint of sweetness because of the pineapples. This would be something easy to do for a busy day. Thanks for sharing the recipe! I love using rice in my cooking but sometimes it can be time consuming so this looks like a great brand to cut all of that out. Thanks for sharing your recipe, it sounds delicious. My husband is not a big fan of rice, but I LOVE it. This looks like a great recipe! Oh yum! My husband would totally love this. He loves ham and pineapple together. That looks so delicious! I’ve never had it before but I’m adding it to my recipe list. This looks like a perfect packed lunch meal, a great healthy alternative to a sandwich. wow, this is something that my husband would love. Thanks for sharing this recipe! This looks so delicious. I love easy recipes like this. I can’t wait to make this for my family. We love having rice from time to time and this sounds absolutely delicious! I would love to give this recipe a try.